New Minas – It may not be as well known as many sectors of the economy, but Life Coaching is becoming one of the fastest-growing businesses in North America. Life Coaching is all about helping people overcome issues they might feel are having a negative impact on their lives. It started over 40 years ago in the U.S. but only recently began to take off there after years of popularity in Europe. Ian Fairclough / Valley Bureau Ronda Degaust and her husband own an NLP Life coaching business in New Minas. Life Coaching is a growing industry in North America. These issues range from desires to be more motivated and to stop procrastinating, to quitting smoking and overeating. Ms. Degaust and Mr. Clarke use a process called NLP – neuro linguistic programming to change how people see what it is they hope to change. For example, a smoker may see cigarettes or smoking a certain way, and the process turns that image into something else, Ms. Degaust said. She said NLP Life Coaching also identifies what led to behaviour that a person is trying to change and helps clarify negative emotions connected to it. Smokers, for example, might have started because of insecurity and a desire to fit in with a crowd. “The process works really well because it works with everything that lies underneath,” Ms. Degaust said. NLP Life Coaches Successful When Others Aren’t! She said NLP neuro linguistic programming does not undermine other forms of therapy but offers another, faster, alternative to help people deal with issues. “Once we find the trigger, we don’t talk a lot about all the stuff that may be connected to it – we just go right to solving the problem,” Ms. Degaust said. Part of solving problems involves changing the way people try to deal with an issue, she said. 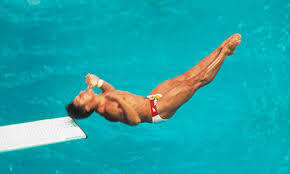 Remember American Olympic diver Greg Louganis hitting his head on the board? Well, that was followed by a series of bad dives, as you can imagine. Greg successfully used an NLP Life Coach to get a successful dive “coded” in his mind. She said that when he started seeing his good dives in his head instead of thinking about how to avoid bad ones, his focus was positive and his form returned. NLP Life Coaches = Success! Having that certificate means supervisors can deal with any number of issues affecting productivity or morale. Ms. Degaust and Mr. Clarke, besides doing NLP Life Coaching on their own, also train people such as managers, educators and supervisors. Her business has been growing, she said, with clients from the South Shore, Halifax – even from England and Malaysia when people from those countries come to Nova Scotia. She has coached clients around the world by phone and Skype. NLP Life Coaching involves making people feel better about themselves, she said, and it can help people become friendlier, more open in relationships – even cure them of phobias and much, much more.